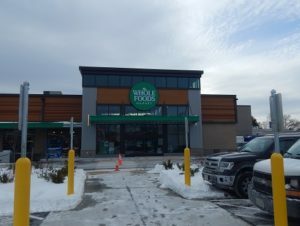 Shrewsbury – Whole Foods Market, located in the new Shrewsbury Lakeway Commons, 193 Boston Turnpike, will open its doors to the public for its Grand Opening Tuesday, Jan. 30, at 10 a.m. with a day full of giveaways and activities for the whole family. They are thrilled to be joining the Shrewsbury Community, the store’s management team said. “Our team has designed a beautiful store that will offer the Shrewsbury community not only a great grocery shopping experience, but also a place to gather and enjoy delicious food,” said Team Leader Alicia Cataldo. Many in Central Massachusetts have been anxiously awaiting the opening of the first Whole Foods Market in the area, but maybe not quite as much as the Shrewsbury Education Foundation (SEF) and four other local organizations. Each of these will receive 1 percent of the opening day net sales as part of Whole Foods Community Giving Program. The SEF is an all-volunteer organization that has been in existence for 25 years and has raised well over $300,000 through charitable contributions and corporate sponsorships. SEF grants encourage creative approach experiences that are not otherwise possible through traditional resources providing innovative programs directly into classrooms. Other organizations to benefit include Big Brothers Big Sisters of Central Mass/Metro West, Shrewsbury Youth & Family Services, Inc., Worcester County Food Bank, and the Regional Environmental Council.